ANDREW WATTS, CEO of Newtecnic*, details the sophisticated technology that underpins the aesthetic facades of King Abdullah Financial District (KAFD) Metro Station. Designed to handle the Saudi capital’s expected 50 per cent growth over the coming years, the Riyadh Metro is a new citywide transport system comprising six metro lines, 85 stations and 176 km of track.The King Abdullah Financial District (KAFD) Metro Station is one of the most eye-catching stations that form part of this mega project. The KAFD station’s intricate facade, reflecting patterns generated by desert winds, was design engineered by Newtecnic to reduce solar gain and produce air currents that help cool the building. The company’s building research team developed new algorithms to achieve this performance level. Complexity is produced by the continuity of the station’s self-supporting, 200-m-long, high-performance concrete-composite walls and roof. To produce the structure, new adjustable building components and fixing methods had to be invented, developed and tested by Newtecnic in partnership with the Engineering Department of Cambridge University. By going back to first principles, all excess and waste have been removed to substantially reduce the overall cost of the building. This ensures the spectacular facades being delivered will last twice as long as regular construction. 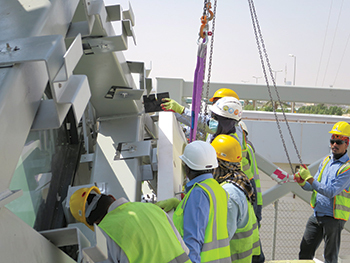 Installation work in progress at the KAFD station site. 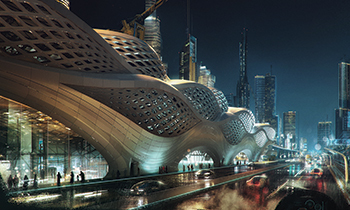 The exterior design of the KAFD Metro Station was driven by the need to provide a weather-tight and thermally-insulated envelope around a supporting structure. The geometry of the envelope is not driven by a structural primitive that seeks to provide only structural efficiency, but also by the need to enclose the interior space with an efficient internal air-conditioned volume that closely follows the external form. Consequently, the zones for the depth of the facade and its supporting structure are required to be minimised to contribute to this concept. The envelope system is driven by the need to minimise installation time through prefabrication whilst achieving a highly durable facade assembly. • Durability of the facade materials, given the extreme environmental conditions in Riyadh to which the building will be exposed. A perspective of the brackets that support the panels. The Heydar Aliyev Centre in Baku, Azerbaijan, was taken as the point of departure for the use of a prefabricated high-performance concrete-composite cassette system, composed of an insulated steel-framed module, to realise an insulated backing wall, which is wrapped by a continuous weather-tight membrane. The cassette system also integrates glazed openings within large areas of perforated panels, set in vertical bays of the facades. The system is protected from the effects of the sun and from accidental damage by large concrete rainscreen panels, which are moulded to achieve the geometrical complexity of the outer architectural surface. This solution, with a higher level of prefabrication, was chosen over the more time-consuming, site-based approach of using profile metal deck supporting thermal and waterproofing layers. To fix each cassette module to the supporting steel structure, the principles of ‘spider’ fixing technology are utilised to ensure high levels of adjustment and flexibility, but avoiding the use of casting, with its higher costs, by using two independent elements fixed to a single threaded bar. This technology is derived directly from fixings for glazing panels, which are supported on cables or lightweight steel structures. These ‘spider’ fixings are used to accommodate high levels of movement of the supporting structures without generating stress concentrations at the points of support. Movements and adjustability with limited rotation are achieved by means of a ball joint located at the end of each spider leg. The main driver for using spider fixings to fix the cassette system to its supporting structure, is that each spider can support four flat panels where they intersect at the corner, with each flat panel set at a different angle. Spider fixings allow the flat panels to be fixed across a doubly curved geometry, where panels meet at given points with different inclinations. Each spider leg can be adjusted independently in length and can accommodate a different angle of rotation. The spider connection also reduces the number of brackets and penetrations through the thermal envelope and accommodates a higher amount of movement from the primary shell structure due to the free rotation allowed at each support. UHPC (ultra-high performance concrete) panels, which are doubly curved, are set on top of the flat cassette panels. The concrete-based panels protect the waterproof membrane of the cassette panels from the effects of the sun. The KAFD Metro Station represents an evolution from the precedent project, The Heydar Aliyev Centre, in which the spatial disposition of the structural members of the supporting steel structure required a secondary structure of tubes that created a link between fixings for the outer panels and the supporting structure beneath. 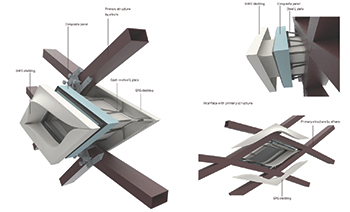 The station building avoids the need for secondary structure by integrating the envelope with the primary structure by closely following the same shape and having the cassette modules fixed directly to the structure. The project is mainly an opaque building enclosure which allows two main facade systems (rainscreen and stick glazing mainly at ground floor level) to be used together without the need for complex interfaces. The supporting steel primary structure is conceived as a self-supporting shell whose structural behaviour is suited to the envelope system to which it is directly fixed. The local movements of the steel structure have been investigated through finite element modelling to interface with the facade system, allowing joint widths between the cassette panels to be determined with a high degree of precision. These joints are made water-tight and are designed to withstand a range of movements during the service life of the building, including thermal movements and lateral displacements of the structure due to wind. The joints are realised by means of compressible insulation, a lapped waterproofing membrane and the use of a double layer of protection against both condensation and water ingress by including a vapour barrier underneath. The geometry was rationalised through a set of early stage iterative studies that introduced a curvature in the perforated parts of the envelope in order to reduce their structural depth. This allowed a significant reduction in the size of the primary steel members in these areas, without altering the architectural intent. These studies were made possible by applying the results of wind tunnel testing to the complete facade enclosure. Results from the cladding pressures allowed the panel depths to be optimised in order to reduce their weight. The single system designed across the envelope integrates glazed panels in the cassette system with the perforated areas of the envelope, where the diamond-shaped panels are arranged in a diagrid configuration. The project required the use of a set of current technologies to achieve the weather-tightness of the building and coordinate economically with the supporting steel structure. The use of well-understood components enabled a higher level of optimisation of the assembly to meet the durability requirements for the facades. The research conducted for the material selection led to the use of a concrete-fibre composite material as the primary material for the rainscreen cladding. Rainscreen cladding technology ensures the durability of the waterproofing membrane by providing protection against accidental damage and ultraviolet (UV) radiation from the sun. Pressure equalisation reduces peak loads on the membrane and protects it from wind-driven rain. Aluminium strips are used to ensure UV protection along the open joints between adjacent panels, whilst allowing the system to be ventilated. Research on material selection focused on establishing clear terms of comparison between different composite materials, which were required to meet the basic requirement of achieving a doubly-curved shape together with the large panel spans within the facade zone available. The design of the assembly has been developed as being independent from the specific material system and technology. The facade assembly is designed to accommodate heavier fibre-reinforced concrete materials to lighter fibre-reinforced polymers by varying uniformly the structural sizes within the assembly, without changing the components or the connections between components. The cladding panels are supported directly from the metal frame of the cassette system, which allows the penetrations through the thermal envelope to be disengaged from the waterproofed joints between the cassette modules. This approach allowed the assembly design of the cassette system to be developed independently of the specific material technology and connection type chosen. As fibre-reinforced composites are engineered materials, their performance is dependent on the specific mix and fabrication techniques used by each fabricator. The research on material selection involved factory visits to specialist manufacturers, comparison of results from physical testing for different mixes, documentation of fabrication processes and surface finishes achievable by each fabricator. An essential aspect of the material research was to establish a set of benchmark values for the use of each material considered on the project, which serve both as a proof-of-concept and establish key constraints in the use of each material. The KAFD Metro Station extends beyond simple station typology emphasising the building’s importance as a dynamic and dramatic multi-functional public city space. Efficiency of pedestrian routes and connectivity are the basis of the internal design and this architectural concept extends to the building’s envelope. Following its long-term design and engineering input, Newtecnic was appointed to oversee the construction stage of the facades. This means the bold aesthetic and technical vision, which it helped through the competition and design stages, can be brought to life retaining the original design intent. Newtecnic is a world leader in the engineering design of complex construction projects and advanced building envelope systems. The company undertakes the engineering design of building structures, facades, and MEP (mechanical, electrical and plumbing) installations in partnership with leading international developers, architects and contractors. Founded in 2003, Newtecnic has offices in the US, the UK and Saudi Arabia. The company is owned, directed and managed by long-established highly qualified and experienced engineers and architects. Newtecnic holds the ISO 9001:2015 certification with the British Standards Institution (BSI).